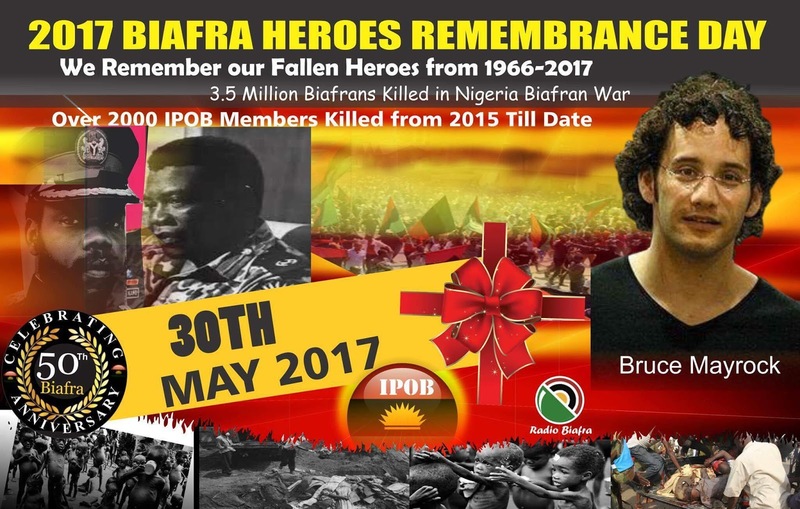 From the Home Office of the Indigenous People of Biafra, we write to remind our great people of Biafra, friends of Biafra and lovers of freedom that May 30th is here again, a momentous day for the remembrance of our fallen heroes and heroines who resolutely fought to resist Islamisation, tyranny, enslavement and ensured that we exist as a people as God intended, hence we must honor their memory and respect the ultimate sacrifice they wholeheartedly made to ensure that we are alive today as a people and a race. We appeal to all and sundry who believe in justice and freedom to fully comply with the sit at home directive of our able and indefatigable leader Mazi Nnamdi Kanu come May 30th to register our dissatisfaction, displeasure and grievance against this wicked and murderous contraption called Nigeria imposed on us by the children of Satan from a distant land called Britain. We must comply because we have no stake in the British Zoo called Nigeria as clearly seen and proven times without number that we are not wanted and will never be accepted by those who seek to ultimately destroy us and take over our land. It is very obvious that we are seen as infidels and therefore only worth beheading and massacring by those who claim to be Nigerians and that is why when we seek bread they give us stones, seek for peace they give us hatred, seek for justices they give us injustice and when we seek for life they give us death, agony, sorrow, bitterness and affliction and therefore the ultimate question remains how can we keep on living this way and for how long? Today we say NO to the murderous enclave called Nigeria by rejecting them and all their Satanic shenanigans starting with sitting at home on the 30th day of May this year to make it clear to the whole world that we are tired of this kingdom of darkness and wants a better life to enable us develop and contribute meaningfully to the development of mankind. Remember it is our duty to restore Biafra for in Biafra our life begins. Say No to Nigeria and be proud to stand tall and defend the quest for the restoration of Biafra.